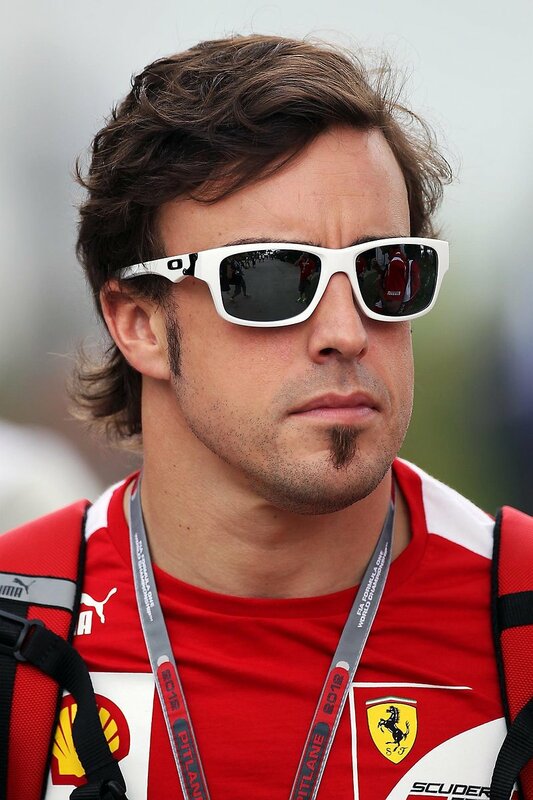 Fernando Alonso wears Oakley Jupiter Squared Sunglasses In Malaysia – and Wins! Former double Formula One World Champion Fernando Alonso was seen wearing these cool Oakley Sunglasses at the Malaysian GP last weekend during interviews and while walking around the paddock. Alonso and his Ferrari teammate Felipe Massa were expected to struggle this weekend after their poor pre-season testing and general lack of performance in Melbourne, Australia. But the Ferrari team were over the moon after Alonso pulled off a surprising victory in rainy conditions, which were bad enough to red-flag the race after only 9 laps of racing. When the race resumed, and after a round of pits stops, the Ferrari driver held a genuine lead, but the race win was never certain, for Sauber driver Sergio Perez was driving the race of his life in second place. The mexican driver was catching Alonso at an incredible rate, bagging fastest lap after fastest lap. It was a nail-biting second half to the race, as Perez eventually caught-up to the back of Alonso’s Ferrari and looked set to take his first GP win. Sadly it was not to be and Perez ran wide at the difficult penultimate corner giving Alonso just enough margin to win the race in a less-than perfect car. Perez came home in a well deserved second place making him the first Mexican to stand on the podium in 41 years. The sunglasses worn by Fernando Alonso (above) were the Polarized Oakley Jupiter Squared model in Matte White, with black trim, black Oakley logo and Black Iridium Polarized lenses. These sunglasses are available in multiple colours in both polarized and standard lens options from SelectSpecs.